Matthew was lucky enough to go to Philadephia with work earlier this year. He was even luckier to get to eat at Horizons and absolutely loved it. I was bitterly jealous, but he did think of me long enough to bring me a copy of their first cookbook back with him. As with most new cookbooks, I looked at it, read it in bed, picked out some things I wanted to cook, then didn’t make any of them because I was so busy recipe testing. But I finally got round to trying something and was definitely not disappointed. This sandwich was quick and easy enough to make when I got in reasonably late after meeting in the pub after work, yet it tasted like something I’d been slaving over for hours. I picked it to use up a bag of seitan bits which I’ve accumulated in the freezer from bits of cutlets floating away into their broth over the years.The sandwich filling is just the bits along with chopped portabellos cooked in a herby broth. I used “Better than Beef” bouillon which I picked up in America and love, but if you can’t get it I recommend using seitan cooking broth or maybe a good broth enriched with marmite to get a similar effect. Then you add caramelised onion and sherry to the broth to make it even richer. The baguettes are toasted with vegan cheese on; I used a mixture of Daiya from the freezer and Cheezly mozarella. 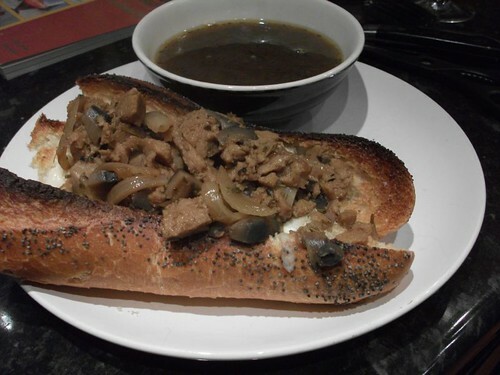 Then the seitan and mushrooms are fished out of their broth and stuffed into the baguette, and served with the remaining broth for dipping. This was amazingly tasty for a dish that required such little work. It had a very classy depth of flavour and went perfectly with the bottle of Vintage Roots Vacqueyras that Matthew picked out. (We buy almost all of our wine from Vintage Roots; they are an amazing company with an excellent range of vegan wine). I will be returning to this book soon! This entry was posted in Horizons by efcliz. Bookmark the permalink. Oh wow, that sounds perfect! this looks awesome. i cook for the vegans in the house and the omnis and think this would satisfy all. What the heck is marmite though, I have seen it in American recipes but it isn’t readily available. Mmm that looks very tasty. Glad to know that I’m not the only person who reads new cookery books in bed! And thanks for pointing me in the direction of your write ups on Portland and Vancouver. Managed to get to Hungry Tiger Too but sadly turned up at the food carts on a Monday when most were closed 😦 Also, got to The Naam in Vancouver and Nuba which I absolutely loved. Awww yeah! I love me a French dip!